Imagine being thrown into the sea at age five and told to swim for the first time. Well, that’s what Ellen’s brothers did to her as it had been done to them years before. Learning to swim this way is what many people do on most Caribbean islands. 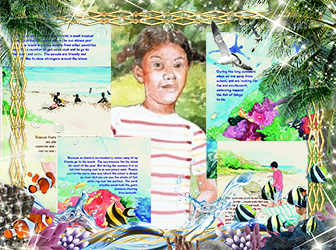 In the story, Ellen finds herself trailing her adventurous brothers who leaves her on a rock in the sea away from the shore while they played at a distance. It was so scary, that they got home to a scolding from their angry mother speaking in her local dialect. Then, they receive a letter from dad all the way from London, England and the adventure begins. Read more to hear what happens. Ellen’s First Swim is the first in a series of three books in the life of Ellen Green. Make sure you read the next two books: Ellen’s Adventures in London and Ellen Goes to Mississippi. When Ellen leaves the island for London, she experiences the bitter winter cold and fog of the English climate, attending school in a new culture, and receiving formal swimming lessons in the Roman baths of London, in contrast to the island sea, she goes on an adventure that leads her to experience many cultural differences and adjustments. Later, she moves to a small town in the American Deep South where she experiences some humerous cultural tradeoffs.